I’m currently working on a new article for Image & Data Magazine about Enterprise RSS and I also have in mind, based on popular demand, the idea of running another short workshop at IPP Consulting on this topic. One idea I have in my head at the moment is to describe a simple model for understanding how and where Enterprise RSS can add value… that is, the Enterprise RSS Value Chain. Consume - Feed content is consumed by end-users. Underpinning these process steps would ideally be an overarching management process. There are also some user and activity flows that are little hard to describe here in bullet point form that also affect the value chain. Overall, I’m pretty confident I can map a range of usage scenarios and technologies to this model, and while doing this demonstrate in certain circumstances the value gap in those approaches. For example, consider that in most organisations that are intentionally making use of feeds, their value chain probably only consists of a limited publish step (i.e. systems that natively generate feeds) and a rudimentary consume step (i.e. through one channel). What do you think? And more importantly, would you like to attend a workshop on the Enterprise RSS Value Chain to explore how RSS can add value? One more thought… if SharePoint looks like the easy option, but in reality it needs to be managed and configured well is it really such as easy option? Actually, maybe the question is who exactly is SharePoint the easy option for? Holding that thought, lets also not forget that SharePoint isn’t the only portal platform out there (yes, its a portal – even if we try to treat it purely as an intranet publishing, records management or collaboration platform [delete as appropriate]). Gartner also think that by 2011, 10% of the major enterprises will be using open source portal systems (e.g. Red Hat JBoss and Liferay). Mashup-based (composite applications) and Rich Internet Application (RIA) approaches will also have an impact on how organisations go about building portals. I would also include the impact of enhanced enterprise wiki platforms in addition to the vendors Gartner considers in scope for this analysis. WebSphere has strengths in “complex deployment scenarios, including high-scalability environments” (I know of one organisation that uses SharePoint, but only trusts WebSphere for mission critical applications) – the downside is that its more expensive. SAP Portal, like SharePoint, is popular where SAP is already deployed – unfortunately, the portal “[user interface] rigidity has constrained use cases” (I think we know what Gartner are politely trying to say here…). Vignette is hanging in there as a leading platform, however right now I don’t think their Web 2.0 capabilities live up to the hype. But even if there are plenty of vendor choices out there, pragmatically is that really an argument for putting the necessary effort into selecting a product rather than simply sticking with that easy option (be that SharePoint, SAP Portal or otherwise)? Since every portal has its pros or cons, if we follow the 80-20 rule the real choice is about deciding if you want to pick the 20% gap you will accept or accepting that you are going to have to learn about the 20% gap that you don’t know about when you pick that easy option. In other words, you can pay now or pay later. “SharePoint can be used as an information management repository for the corporation and then this can be supported by using it as a collaboration environment as well (which is what we have done). However, this needs to be properly structured so that the "best" content can more easily be identified and found by search tools (be they out of the box SharePoint search or other search tools). It also needs some careful consideration of metadata management (column management, something SharePoint is currently very weak in). By building (or buying) additional tools you can maintain consistent metadata across thousands of sites enabling very effective metadata search capabilities across millions of documents. You then have an information management repository solution that can be fairly simple for the users to use. There are some valuable lessons here. 3. Be careful what you use it for, and how you use it. 4. Collaboration is only one of the six pieces of SharePoint 2007. I’ve been following Michael’s blog for while and have also read his 7 pillars analysis, so I’m quite confident about the validity of his assessment. However, reading Eric Mack’s post today a thought occurred to me that one point to bear in mind about these conclusions is that Michael’s 7 pillars framework assumes that the level of the organisation’s collaborative maturity is the same. What this means is that SharePoint will work for some organisations BUT only in short term if their collaborative maturity is very low (i.e. basic document sharing). However, when that collaborative maturity improves you will run into problems – particularly if your IT department has mandated a “vanilla” out of the box deplolyment (which is their attempt to keep SharePoint manageable over the long term – that’s the “it can’t break if we don’t change anything, ever” method). Of course the issue of mismatching current and future business requirements to technology capabilities applies as much to SharePoint as it does to any other kind of collaboration or portal technology. Its also likely that any information management or collaboration technology will require some kind of mitigation to make it truly fit for purpose in practice (in part that’s about implementation, not installation). So, are you implementing SharePoint with your eyes open? Do you understand the collaborative maturity of your organisation and how it maps to SharePoint’s capabilities? Or maybe you are looking at other collaborative or social computing technologies with the hope that if its not SharePoint, then you won’t need to worry about planning for a good fit with business needs? We had a great morning yesterday with our mini KM Bootcamp, held at IPP Consulting’s new offices at 50 Pitt Street in Sydney. This event attracted the interest from people in the professional services, education, government and health sectors – I even had to turn a few people away as we had reached our room capacity! Don’t get caught up trying to define KM, it’s the discipline that dare not speak it’s name. KM activities often provides a focus on areas where growth, restructures and cutbacks has eroded organisational slack – mentoring, innovating and generally sharing points of view. There is nothing as powerful as an idea that’s time has come. When the boss decides it’s time for KM, it’s time. Need to understand the organisational culture and influence executives and thought leaders, sometimes indirectly. Mix of technology and people approaches, pendulum swinging back toward people orientation. Ageing workforce is a critical issue for organisations. Law firms have a deep knowledge of their specialist subjects such as precedents but after that it can be hard to diversify the effort. Funnily enough, last night while Skype’ing with David Gurteen to help plan his visit to Sydney in September, we had exactly the same conversation about the first point. We both agreed how pointless it is to worry about what we call Knowledge Management when fundamentally the issue is that there are business problems to solve and this is where we should really focus our energy. Look out for similar events on other knowledge, information and technology topics in the future – in fact, feel free to get in touch if you have an idea for a topic or would simply like reserve a spot in advance! Last year I ran a workshop on Intranet 2.0, however this time around I'll be making a presentation during the conference on Enhancing employee performance with real time content and personalisation. I'll be touching on search and Enterprise RSS as part of the presentation. 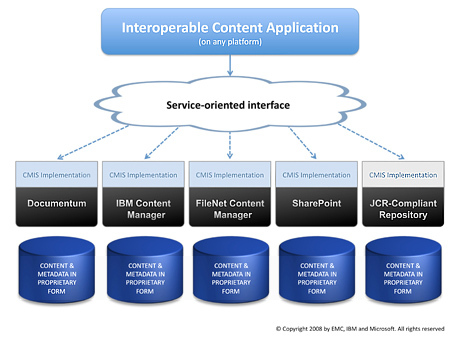 What's up with the Content Management Interoperability Services (CMIS) specification? Yesterday I mentioned the Content Management Interoperability Services (CMIS) specification, which has been under development for the last couple of years and has just been submitted to OASIS. So what's this all about? The vendors who are making noise around the standard included Alfresco, EMC, IBM, Microsoft, OpenText, Oracle and SAP - in itself an interesting reflection of the diversity in the ECM space these days! "What I don't buy (just yet) is that this proposed standard is all that was missing to allow customers to keep their content just where it is and usher in a new and glorious era of enterprise mashups. The standard provides the common baseline of access/retrieval/interaction with unstructured content and its metadata across the participating ECM systems. You can bet the vendors will start here and differentiate on top. But just the fact that we're all starting here is a very good step in the right direction. Keep in mind that, right now, this is a .5 draft specification so we will see maturation as time goes on and folks sign on." Obviously there are still are a lot of details to digest and we need to see all the different vendors actually implement the standard such that it meets the goals of interoperability, but I think the inclusion of a Web 2.0-oriented approach in the specification gives CMIS a good chance of broader adoption. Overall it sounds like if you're in the market for ECM, you better start thinking about adding CMIS to your wants list! Back in 2006 I attended one of the most useful training courses I've ever attended, on IMA's Accelerated Implementation Methodology. I've spent most of my professional life as a change agent of one form or another and had even picked up a few good methods, tools and frameworks along the way through my MBT. However, AIM has provided what I would call a great change management "pattern" where I can apply the theory and tools I already had. Cai Kjaer at Optimice thought AIM was so good, he formed an alliance with IMA to use their methodology in Austalia. This morning I was invited by Cai to head IMA's founder, Don Harrison, to talk about AIM. For me at least, this turned out to be a great refresher on why AIM so useful, and also so important. I help organisations to implement information and knowledge work technologies, not install them. "When we analyze project successes and failures we see that project installation and implementation are very different. Yet many organizations assume completion at the “cutover” point – installation." "more than getting to project launch or “go live” — implementation means meeting all technical, business, and human objectives on time and on budget. " "These requirements might “ruin the party” about how people foresee microblogging taking off within the enterprise – but better to plan for such features now, and push vendors to deliver those functions, than ignore some basic blocking-and-tackling issues that inhibited rollout of enterprise instant messaging. These requirements might “ruin the party” about how people foresee microblogging taking off within the enterprise – but better to plan for such features now, and push vendors to deliver those functions, than ignore some basic blocking-and-tackling issues that inhibited rollout of enterprise instant messaging." This is a serious issue - don't forget that even today some organisations are still debating the value and risks of instant messaging. How do I know? Well, time and time again over the years I've found myself at the front line of educating users and explaining to decision makers why they really are valuable business tools. Unfortunately, from a technology architecture view, microblogging is not quite the same as instant messaging. Interoperability is the exception with most enterprise instant messaging platforms, but for the generation of new Web 2.0 inspired enterprise microblogging applications, interoperability and extendibility needs to be built in from the ground up. Just don't forget we still need stability and have to meet our compliance and legal responsibilities too. Delivering both, in the immediate term at least, might be a tall order for vendors with legacy code bases and also the new players alike. Incidentally, I was reading the other day about Content Management Interoperability Services (CIMS) - maybe this is the interface we need to allow interoperability between enterprise social media and enterprise content management? Alex's great follow up post about my thoughts on the nature of blogging resulted in a flurry of comments on his post, but the discussion also leaked out into other conversational platforms, including Twitter and even a Yahoo! Groups mailing list. That in itself is a great example of how online conversations flows through different mediums and tools - blog comments are part of that ecosystem, but not the only channel for conversation. And in fact, let's not forget the unmediated conversations going on offline. "For me these days a blog is little more than a sophisticated, easy-to-use website platform. A place where an individual or a department/function can have their own site quickly and easily. Simplistic that may be, but whether news posts or thought articles, the commenting or conversation aspect of blogging appears to by dying down in many places... Yet blogs without comment aren't necessarily lacking in readership - or even participation. This is where the "intent" aspect of James D's manifesto falls down for me. I don't think conversations necessarily make a blog." I don't think either that the level of readership or participation (comments or otherwise) at a particular point in time is a reflection of the blogger's "intent". However, the ability to comment on a blog does reflect that the blogger is open to the potential for further conversation. Bearing in mind that most users don't create new content (think of the 1% rule) and aren't twittering, commenting at least provides an option for everyone to participate. "Tools are becoming easier to use and adapt to our needs. They are inching towards transparency. We will continue to interact with technology and ourselves in new ways that we do yet not have the perfect words for." To refine that point a little, I think in some instances blogging tools (and other social computing technologies, like wikis) have actually tapped into what was a previously unmet need for light weight content management and publishing systems. In the past very few organisations provided people with access to the kinds of tools that would allow this, but Web-based tools and open source have certainly worked to remove that barrier (and created products with better usability in the process). Incidentally, someone also commented to me offline that the issue of defining blogging is again confused by the use of the word as both a verb and noun, similar to the (mis)use of the word wiki. But none of this is really core to my point. Overall I don't disagree with any of Alex's observations about the state of blogging. However, fundamentally my point of view is based on the desire to tease out the different use cases for blogging with the objective of understanding it better as a workplace technology. Simply observing change doesn't inform potential users of the outcomes they should expect by following a particular strategy. Putting this into context, one of my big concerns about social media like blogging is that organisations approach it as a technology that can be simply deployed and will magically result in a positive organisational outcome - typically that might be something around better communication, fostering social capital and maybe even innovation. The reality of course is that despite the ease of deployment and use a blogging platform provides, ultimately it is how you choose to use it that will make the difference. And simply pushing out content won't make staff or customers engage with you. Note that this is of course different if your intent is simply to use a blog to publish or host content. While clearly the evidence suggests that you can't simply view blogging as the only social media channel, however for me its still the lowest common denominator place for starting a many-to-many conversation. What then interests me further is helping organisations with the gap between the intent and reality of how they go about blogging to start that conversation. So, If you have a blog and no one is commenting, my general advice is to pursue it with the expectation and intent that one day they will. But if you accept a mediocre approach, then surely you can only except a disappointing response in return? "I wonder whether the value of many virtual meetings is so low as to make them more expensive than face-to-face meetings. I have participated in many teleconference meetings which have been massively protracted by the limitations of the medium. These meetings have then used far more time than a physical meeting would have, but they have also added massively to the lead-time for resolution. In one particular occasion we were working on a technical problem for over three weeks before a face-to-face meeting resolved the problem in under 2 hours." I think part of the problem is the expectation that you can simply swap any kind of traditional meeting for a virtual meeting, but this simply isn't the case. Its not a replacement, but a different style of communication and collaboration. Typically a mix of technologies, skills and other resources are needed to be successful - including knowing when only face to face will do!